Ken and Bev Becket are owners and artists who strive to blend the beauty of available hardwood species through our woodworking passion with an artist’s eye and laser engraving technology. With our combined talent, we make beautiful quality art that will last a lifetime. We work hard to achieve perfection and are proud to put our name on each piece. Using the air brush to add color to a custom coaster. We enjoy working on a custom design basis with each client, incorporating logo designs and/or slogans. 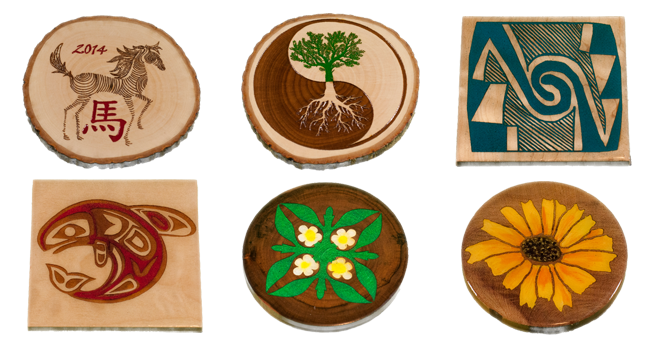 Individuals my want to preserve special occasions such as births or marriages in wood with a specific design on a beautiful plaque, coaster or ornament. We may be reached at (503) 590-7340 or contacted via e-mail at ken@alliedpacific.net or bev@alliedpacific.net. Our Studio is open by appointment only. Please visit our Facebook Page for more information and to see our latest designs.